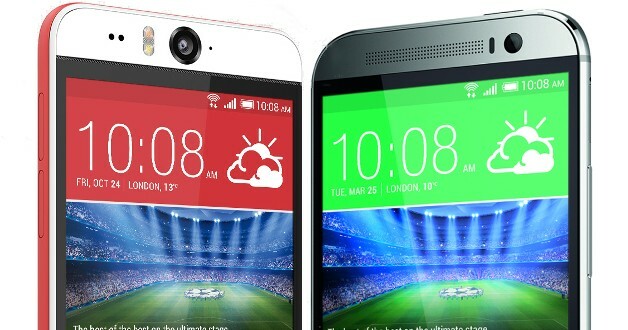 Home » Tech » HTC Desire Eye vs HTC One M8: which has better bang for buck? Does the HTC Desire Eye have better value than the One M8? HTC Desire Eye vs HTC One M8: which has better bang for buck? Both the HTC Desire Eye and HTC One M8 are flagships of last year, one more appreciated than the other. The HTC Desire Eye reflects the Taiwanese company’s attempt and recent trend to create smartphones that are centered around their camera performance. When the Desire Eye was launched, HTC also demoed the Eye Experience camera software and Re Camera, which are both niche offerings for photography enthusiasts. Many were looking forward to the HTC Desire Eye so we’re going to see how it compares to the company’s flagship for the year 2014, the HTC One M8. The HTC Desire Eye comes with a slightly larger display than on the One M8, measuring 5.2 inches, which is in my opinion, the ideal smartphone size at this point. It’s not in the phablet category just yet, but it is larger than most smartphones on the market nowadays. The larger display feeds into the people’s needs for larger screens and their willingness to sacrifice one-handed use altogether. The HTC Desire Eye display comes with a 1080*1920 resolution that adds up to 424 ppi pixel density, which is more than enough on such a phone. The display is crisp and clear and it’s a perfect example of why QHD might not be necessary on smartphones. The HTC One M8 comes in with a smaller display that measures 5 inches. Still, the phone has rather thick bezels, so the smaller screen doesn’t help much with one-handed use of the device. Still, the display is a bit denser, as it comes with the same 1080*1920 resolution that adds up to 441 ppi pixel density. When you put the Desire Eye next to the One M8, you’ll barely notice the difference in pixel density. The One M8 seems just a bit brighter and comes in with better outdoor visibility, but otherwise the difference is minimal. The quality of the One M8 display is slightly better, but protection is the same on both handsets, namely Corning Gorilla Glass 3. Design-wise, the HTC One M8 has been the talk of the town. It’s one of the best phones on the market right now thanks to a sturdy aluminum build that comes in the form of a unibody. The non-removable battery is an issue for some people, but the handset’s battery holds out pretty neatly, so it shouldn’t be too big of an issue. The bezels on the One M8 are a bit too much, but they hide the marvelous BoomSound speakers on the front, so it’s a positive compromise in my mind. The HTC Desire Eye isn’t anything to write home about when it comes to design, as it gets a plastic chassis similar to the one seen on the cheaper HTC One E8. It’s not as sleek and shiny as the One M8 chassis, but it doesn’t feel cheap either. The bezels are a bit thinner, but you still get BoomSound speakers, which is great. The Desire Eye is a bit harder to maneuver because it’s a wider phone, which makes one-handed use a bit cumbersome. It’s not a deal-breaker, but if you have small hands, wielding the Desire Eye might be a challenge. As you can imagine, the Desire Eye isn’t a flagship, rather a niche device intended for smartphone photography enthusiasts. Still, hardware-wise it can easily rival with the HTC One M8, Galaxy S5 or even the LG G3 if you don’t count the displays. Now the Desire Eye comes with a Snapdragon 801 CPU, backed up by 2 GB RAM and 16 GB expandable internal storage, which is rather neat. The CPU is clocked at 2.3 GHz and is paired with an Adreno 330 GPU for excellent graphics. If this specifications sheet sounds familiar, you should know that these specs are identical to the HTC One M8. That means that the HTC One M8 comes with the same Snapdragon 801 CPU clocked at 2.3 GHz and paired with an Adreno 330 GPU. The only difference here is that with the One M8 you get to choose whether you want 16 GB expandable internal storage or 32 GB expandable internal storage, both backed up by 2 GB RAM. If we’re talking about performance, the two handsets are at the same level. The Desire Eye doesn’t benefit from Android 5.0 Lollipop yet, but the HTC One M8 is getting the update slowly all across the globe, so that’s a plus for the flagship. When it comes to camera performance, many were disappointed by the 4 MP UltraPixel camera on the HTC One M8, even if it came with an extra depth-sensor. The front camera was rather good, though, with a 5 MP sensor capable of shooting 1080 video at 30fps. The rear camera comes with quite a few nifty features, but the overall quality of the pictures leaves room for improvement. The same can’t be said about the HTC Desire Eye, as the Taiwanese smartphone manufacturer put a lot of emphasis on camera with this phone. You get a 13 MP sensor on the rear with autofocus, dual-tone LED flash and HDR, and you get the same setup on the front, too. Indeed, that includes the 13 MP sensor, dual-LED flash, HDR and 1080p video recording at 30fps. That setup is pretty neat and makes for a ton of high quality photos, which look good even if taken in low-light conditions. It would have been nice to have a depth-sensor included in the package, but one can’t have everything, can they? The odd thing about the HTC One M8 and Desire Eye is the choice of batteries the company made. The HTC One M8 comes with a pretty beefy 2600 mAh battery unit which can last for two days with light-to-moderate user interaction. Note that battery life depends very much on user interaction and preferences, as well as maintenance and upkeep of the phone and battery itself. With that in mind, we were a bit surprised to see that the HTC Desire Eye battery is actually smaller, measuring 2400 mAh. That’s an odd choice seeing as the dimensions of the handset and the larger screen would not only allow but ask for a larger battery unit within the phone. And it’s still non-removable. HTC actually advertises the HTC Desire Eye as having a longer battery life than the One M8 flagship. When it comes to price, you might be surprised by the outcome of the comparison between the One M8 and Desire Eye. The One M8 goes for around $380 with no contract and factory unlocked, with 32 GB internal storage, which is a pretty neat price for a rather awesome flagship. The Desire Eye is the newer phone, but since it is based on the One M8 and aims to improve only its camera specs, we would have expected a lower price, especially with the plastic chassis. The unlocked Desire Eye price is actually around $500, which is quite the jump in pricing. Our conclusion is clear here. The HTC One M8 is the better buy, because it comes with a more durable chassis which can endure a lot form the user, it has a bigger battery, Android 5.0 Lollipop and a significantly lower price tag on most e-commerce websites for the unlocked model. The Desire Eye is a great niche smartphone with the high-end camera setup, but we would have liked a bigger battery and a more affordable price for the handset. Which one would you choose as an upgrade to your existing phone?